Behind every good florist is their workbox - full of the tools of their trade. Without it they wouldn’t be able to work successfully after all you never see a hairdresser short of brushes or a seamstress without her needle and cotton! A well stocked workbox, full of your basics, is essential, particularly if you need to travel to do a job on site. Any plastic box will do – ones with compartments are ideal - and these are available form the majority of good DIY shops or a well known Swedish home store! It should be easy to carry and compact enough to store. Scissors - to cut stems, wires, ribbon etc. Knife – for cutting stems and floral foam. Take care how you store this in your box to avoid any unnecessary accidents. Wires- used to support, control and anchor materials or to lengthen stems. Wires come in different sizes. It is a good idea to keep wires in separate boxes or containers as the ends can be quite sharp, also store different sized wires separately for easy access. Wires should be kept in a dry area to avoid rusting. Tape - this is used to conceal wires and seal stem ends. There are usually two types of tape – one made of a very fine plastic material which stretches over wires, stems etc and is pliable when warmed up by your hand, while the other is more like crepe paper which is slightly sticky. Floral tape should be kept dry. 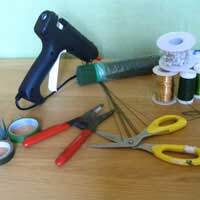 Glue gun - Used to attach ribbon to foam bases; attaching foam to containers, attaching swags or flowers into bouquet holders. There are two types – hot and cool. Cool is usually used with materials that may melt. Stapler- Used to attach ribbon or create a ribbon base. Use with care so not to staple ourself and put away after use. Floral foam - this comes in various colours, shapes and sizes designed to fit into different containers. It should be kept in a dry area to avoid moisture getting in. Be careful when cutting foam as small pieces could fly into the eyes and cause irritation. Floral foam is generally fire retardant. Containers - there is a huge range of containers of various shapes and sizes, generally made of plastic, which are ideal for floral arrangements. Should be stored away so as not to clutter up work area. Boxes - to transport flowers that may be travelling some distance. Bridal boxes for packaged bouquets, buttonholes, corsages etc. Store these out of the way. Ribbon - to finish off bouquets, plants etc to add an attractive finishing touch. Again usually stored on a roll. Gift cards and care cards - for the recipient to know where the flowers have come from (and usually why!!) and to know how to care for their flowers/plant etc. Gift cards are usually on display in the florists for the sender to choose.